I have been on holiday this week, mostly to celebrate the close of the shooting season and the consequent opening of the archaeology season (Yay! The Glorious 2nd!). Not, to be fair, that I have lacked archaeology over this winter. Anyway, Saturday – the last day of the shoot – was a glorious day, and I decided to get well out of the way, and visit Framlingham and Orford castles. Orford I have visited several times whilst researching Wimer, but I have been sniffy about Framlingham, because what remains is later than I’ve been interested in. However, the Wimer sequel is in the right timeframe, so I decided to go along; then to drive from Framlingham to Orford, a direct trip I haven’t made before. Visiting Framlingham was useful for scale, and for viewpoints. The encircling ditches were never filled with water, being a dry route for soldiers to move unseen around the perimeter; I wouldn’t have known that without visiting. Also, the River Ore forms a large mere on the North side – I think that was a conceit of the Howards, centuries later, but when I was there the whole river valley was flooded; I think, in the same weather conditions, it would have been just as defensive in 1216, when John attacked the castle. They surrendered after two days – Roger Bigod was away; I bet he swore! I am left with a puzzle, though. Henry II had Hugh Bigod’s motte and bailey at Framlingham destroyed, after the Young King rebellions in the 1170s. However, the English Heritage people were insistent that the stone chimneys visible in the curtain wall of the 13th C castle were remnants of the earlier castle – in fact, of the Lord’s chambers. How, if the motte was demolished? There’s no sign of it now. 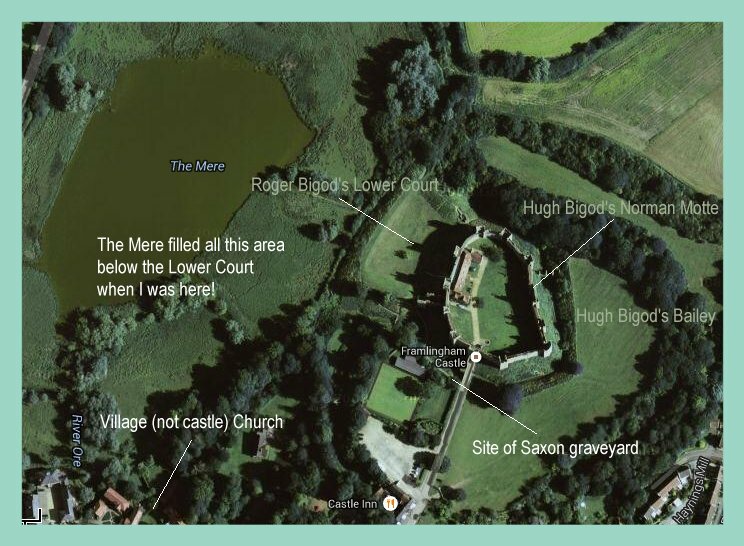 They also suggested that the castle’s orientation has flipped 180 degrees, with Hugh’s castle oriented South, and his son Roger’s, to the North. Here’s a sketch, using Google Maps. There were some interesting facts on how the castle was provisioned; in 1386 the dovecote produced 431 pigeons, and there were a team of falconers employed to fish from the mere! I also loved the drive between Fram and Orford, through Parham, Campsea Ashe, and Tunstall. I indulged my church bent, and went into them all 🙂 Something I hadn’t realised is that the route runs alongside the River Ore – now not much more than a stream, but was it bigger then? Even navigable, or suitable for poling a boat up? The other major impression was how dark and huge Tunstall Forest is, even now. The river route might have been much safer! I hope you enjoy my books as much as I loved writing them! Here’s my Amazon page. If you’d like to know more about my writing, you can sign up for my newsletter. Some of my bonsai come from Tunstall forest. There are some dark and old bits to it. Wasn’t that where you once saw a white hart? The forestry people say there can be as many as half a dozen white deer in Tunstall and Rendlesham. The white hart was Rendlesham. Tunstall has been entirely off my radar until now; but I see it needs to be explored.